For more detailed information and updates about the Fore River Bridge Replacement Project, please visit the DEDICATED FORE RIVER BRIDGE PAGE AT MASSDOT. In August 2012, J.F White & Skanska-Koch were awarded the contract for $244 million to construct a new Fore River Bridge. Construction began in November 2012 and was for the most part completed in 2017. The new Fore River Bridge was opened to full traffic October 1st, 2017. Some finishing touches are still being wrapped up as of February 2019. This newly designed bridge has replaced the temporary one which was built in 2002. The “temporary” bridge was designed for a lifespan of 15 years. This is a picture of the Bascule style bridge which was built in 1936. Many residents fought to bring back this style of bridge. However, due to the channel width restrictions, MassDOT went ahead with designing a vertical-lift structure. 10/2/2012 – Weymouth Patch. Officials Skeptical on Fore River Bridge Relationship with DOT. 1/12/2011 – Patriot Ledger. 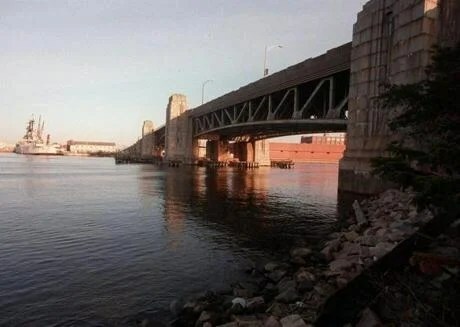 What kind of bridge should replace the Fore River Bridge?